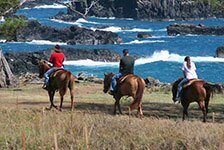 Maui horseback riding tours allow visitors to enjoy the fresh air and beautiful sights of Maui while riding along some of the island’s best horseback riding trails. Ride your horse to the West Maui Mountains, marvel at the waterfalls, and visit the oceanfront. Book your Maui horseback riding tour below!